You might recall that I posted yesterday about a new Wifi equipped ereader thatis going to be sold as the Cool-ER (and might be coming from Kobo). 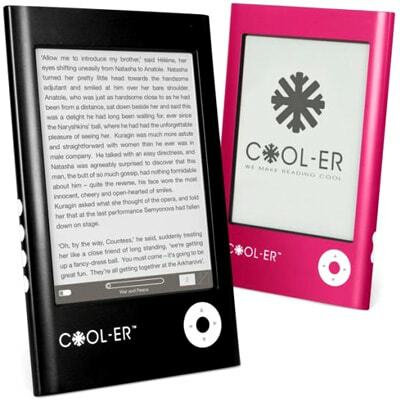 The good folks at Interead sent me some info on their new ereader which they're calling the Cool-ER Connect. While I don't have any info yet on the possible Kobo ereader, there is a good chance that it will have the same hardware (if it exists). The Cool-ER Connect does have Wifi. It also has a touchscreen. But when it comes to physical appearance, I was told that it will look like the current Cool-ER. The Cool-ER Connect is one of 2 models that they named at CES back in January. The other is the Cool-ER Compact (at left). Both devices have a 6" E-ink screen, and the notable detail of the Compact is that it's more, well, compact than previews models. I held the Compact at CES, and I thought it was a nice hardware design. Both ereaders will be out September, and the Connect is going to be priced at less than $249 (the price of the current Cool-ER).